Prior to the start of the 2015 school year, Queen of Angels Catholic School knew their 16 year old original analog paging system was on the brink of failure and began looking for newer, better technology. The original system was extremely difficult to use and did not allow for any alternate bell schedules to be programmed. In addition, a single programming error made would equate to starting over with programming for the upcoming years schedule. The antiquated wiring was also resulting in poor communication and an inability to clearly hear pages into the classrooms. Ken Kenan, Maintenance Manager, said he turned to South Western Communications, SWC, after working with Wayne Henley on an upgraded Rauland clock system several years ago. Upon a visit to the SWC office and seeing the available solutions, Rauland Telecenter Campus and Sielox Class clearly stood out as ideal solutions for implementing new, improved technology. Kenan says one key to selecting these systems was their ability to sit on servers and save space from needing large towers in his server room. For Principal Molly Carlin, the key was the ability of Telecenter Campus to integrate with everything: cameras, access control and phone systems, allowing for a seamless solution. Carlin knows there is a fine balance to maintaining a welcoming learning environment for students while also implementing sound security solutions that keep them feeling safe. She was able to accomplish both with the installation of these new systems. Using Sielox Class technology, teacher’s can quickly provide updates concerning what’s happening in the classroom which then displays on a real-time graphical floor plan map. A teacher with a problem can change the status of the classroom from green for okay to red for a serious problem on a computer screen. That information is instantly accessible to resource officers, school administration, and anyone else who needs to be alerted. If faced with an emergency, Sielox can trigger a lock-down, activate a pre-recorded message over the PA system and alert first responders, all simultaneously triggered with a single button push. Prinicpal Carlin says “For teachers it has to be easy. We have a 99% check-in rate everyday with Sielox in order to practice the system and ensure it is up and running.” Thus far utilization has been great because the teachers find it simple to log-in and make status updates. 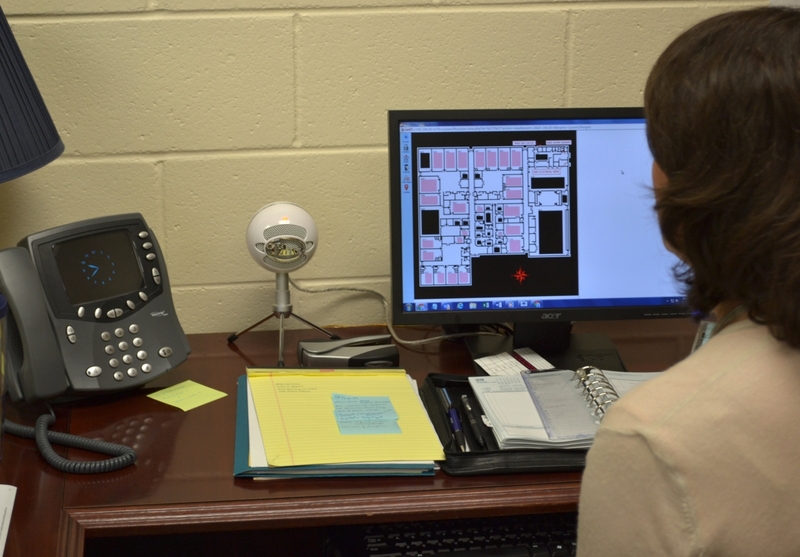 The Telecenter Campus system can be utilized for multiple bell schedules, live announcements, emergency tones, and pre-recorded instructional messages to direct students and staff in the event of an emergency. One key feature is the ability for Principal Carlin to pre-record overhead announcements using the system. Having her voice initiate a lock-down has been very effective during drills this year. A calming, familiar voice keeps students at ease and no longer triggers unwarranted chaos or panic. 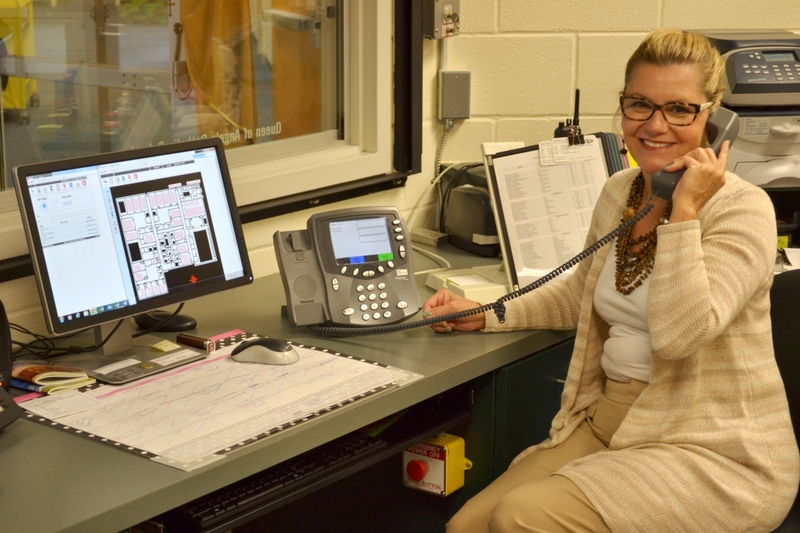 Carlin is also pleased with the ease of use with which she is able to make changes to programming, update bell schedules and record announcements. Utilizing Telecenter Campus the push of a silent panic button now integrates to ensure all doors, including pre-existing fireproof doors, now lock automatically in the event of a school lockdown measure. Carlin previously could only do an all-call overhead page from the front office. Now she is able to enter a four digit code on any console and place an overhead page or trigger a lockdown from anywhere in the building. This improved feature also allows both the receptionist and school nurse to page into the classrooms using a single device. 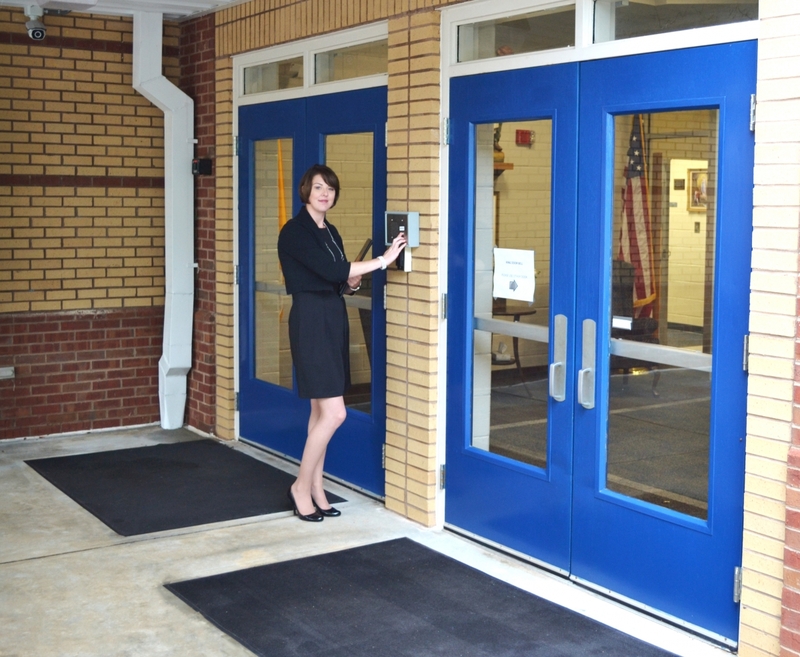 The school’s new security measures include a door access control system which requires someone to verify visitors before unlocking outside doors for entry. This can conveniently be done via the Telecenter Console. In the event the receptionist is unable to unlock the door, the call would escalate to two further offices where staff are able to utilize the access control cameras to visually see the visitor as well as speak with them via the secured entry speaker prior to unlocking the door.